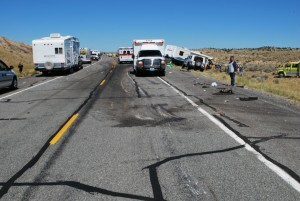 Often occurring instantaneously, little is more frightening than a vehicular accident, especially when it involves a motorhome. Sometimes, it is only afterward that the pieces of the puzzle come together. Defensive driving only gets you so far. 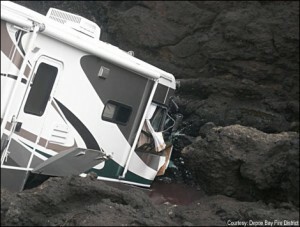 Some RV accidents are just that—accidents. Whether it is a random gust of wind, a bad tire, or mechanical failures—sometimes accidents are nobody’s fault. These six accidents could have happened to anyone. Count your blessings that they didn’t happen to you or someone you love. Please share as a reminder to always be diligent about maintenance and to be thankful for each safe journey. 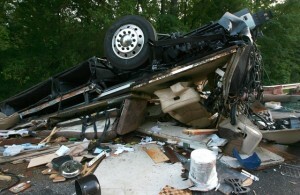 In 2012, Timm and Theresa were innocent victims in a strange RV accident involving a police chase. 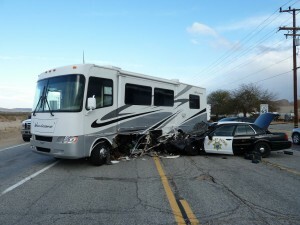 While driving their motorhome, they were T-boned by a police cruiser. A California Highway Patrol Officer was in a high speed chase, following a 78-year old suspect through the deserts of Joshua Tree, California. Here you see the police cruiser jutting out from the cargo bay of the motorhome. This shows the damaged cargo-bay area and the aftermath of the accident. The suspect swerved to avoid the couple’s RV, but the officer was unable to react. 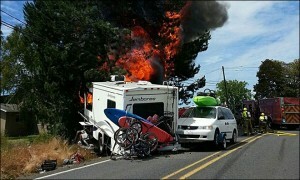 Although he collided with the motorhome, nobody was seriously injured. 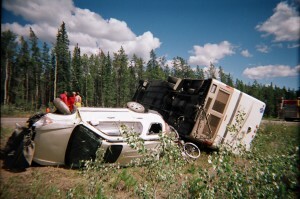 Often, accidents involving motorhomes happen in remote areas. This is usually due to the roads being narrow and turns being tighter, lack of signs, or wildlife crossing, etc. 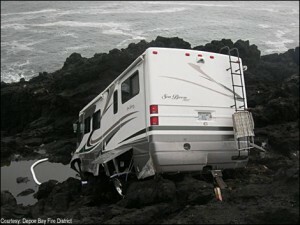 In Forest Grove, Oregon, however, an accident occurred when an SUV slammed into an RV. The Jeep Cherokee’s driver was driving too quickly and hadn’t left enough room between his vehicle and the vehicle in front of him. When the traffic stopped, he was unable to slow down. He tried to remedy this by swerving into the other lane, where he directly hit the motorhome. 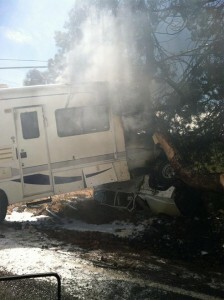 In fact, the impact caused the RV to end up on top of his SUV. Fortunately, although the driver of the Cherokee was flown to the hospital, the passengers of the RV weren’t severely injured. Unfortunately, the individuals involved in this accident weren’t as lucky. 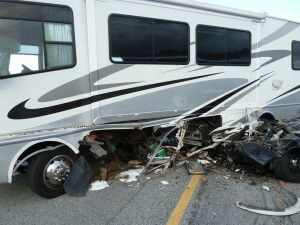 When the driver of an SUV swerved into the oncoming traffic, it crashed into an RV. This is the most devastating wreck. 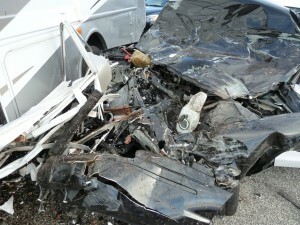 When two vehicles collide, the smaller one often sustains the majority of the damage. 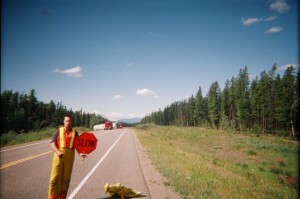 The skid marks show the path that led to the ultimate accident. Apparently, it happened so quickly that the drivers of neither vehicle applied the brakes. 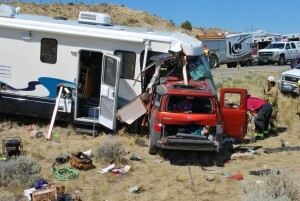 Four people in the SUV died, as did a three-year old passenger in the RV. Probably the strangest incident, the RV in this story was stopped when a 79-year old man exited the motorhome to walk his dog along the coast, but then the brakes failed. 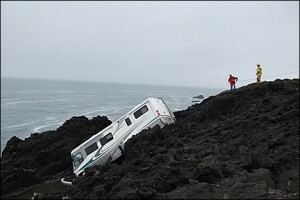 The poor man had to stand helplessly by, as his RV slid 100 feet down a cliff overlooking the Pacific Ocean. Fortunately, it remained teetering on the rocks rather than continuing its descent. A heavy-duty tow truck was called to the rescue. 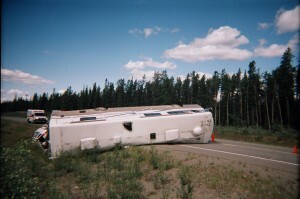 This motorhome flipped when the driver, attempting to avoid driving into the ditch, overcompensated. When he swerved, the momentum caused it to flip. It also tipped the car that it was towing. 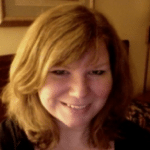 Ken and Tammy Kirk, along with their three dogs, were headed to a white-water rafting trip, when they had their RV accident. 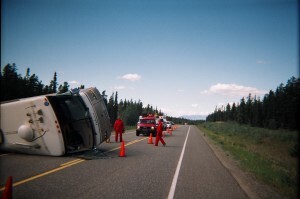 The motorhome turned over when the driver swerved. 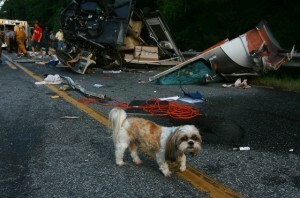 Everyone survived, dogs included, but the couple was taken to the hospital with minor injuries. Both the South Carolina Troopers and Ebenezer volunteer firefighters attended the scene. Be vigilant. Stay alert. Allow plenty of room between your vehicle and the one you are following. Make wide turns, and make sure to always wear your seatbelt. Try to know the area you plan to be driving in, and remove all distractions. Keep your insurance up-to-date. Please be safe, and share this with your friends and family members who may find themselves traveling. You might be saving their lives, or the lives of other people on the road.